Carlos “CJ” Chapparo is from the hard streets of Camden, NJ. Born into a family he describes as “overprotective,” CJ is very grateful for his second home, Steve’s Club, a place where his parents can feel good about him visiting each day after school. Helping at-risk youth realize their potential through fitness, nutrition and leadership skills is the driving force behind Steve’s PaleoGoods. Each purchase changes lives–15% of the proceeds go directly to Steve’s Club National Program (SCNP) that has 30 local clubs around the country. CJ’s parents moved to Camden from Puerto Rico when they were teenagers. The Chapparos enrolled CJ and his sister in charter schools where there was a greater emphasis on academics and safety. When he started at Steve’s Club, CJ was barely 5-foot and 100-lbs. CJ now stands 5-foot, 8-inches tall and is 180-lbs of pure muscle. Before and after class, CJ can be seen practicing gymnastics including back flips, back tucks and handsprings. His favorite lift is the back squat, and he excels at calisthenics. 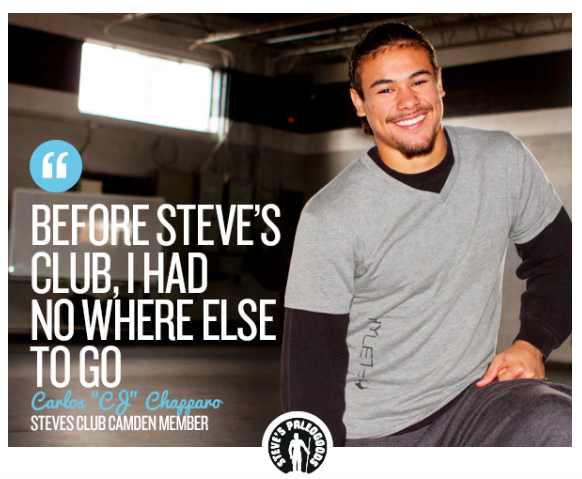 Every day after school, about 40 young athletes from Camden pour into Steve’s Club, located at the Steve’s PaleoGoods headquarters. They lift weights, jump on boxes, climb ropes and do pull ups–as a way to pull out of the perils of street life. Some of the older teens like CJ even work next door in the warehouse where Steve’s PaleoGoods are made, packed and shipped. CJ was just shy of his fourteenth birthday when he started. He remembers it taking him about two months to get adjusted to the intense regimen. He’s now eighteen, a freshman in college studying Criminal Justice. He is thankful for all that he has received from Steve’s Club. Although CJ has found a safe haven at Steve’s Club, he is no stranger to the dangers of his hometown. He has witnessed more violence than he cares to recall, and even witnessed a few of his friends shot and killed. Much like this mentor Steve, CJ wants to open a gym someday. He also dreams of serving in the Marine Corps and pursuing a career in Criminal Justice. For more information about Steve’s Club, visit stevesclub.org.